There is not a finer sound than to be walking on the Dartmoor commons on a summer’s day and to hear the distinctive call of a cuckoo. I have heard hundreds of them but would estimate that I have actually seen about a dozen. This elusiveness is what adds to the character of this bird and its associations with both good and evil. There is quite an extensive folklore tradition concerning the cuckoo, for instance on hearing the first cuckoo in spring one must run three times in a circle, with the sun to ensure good luck for the rest of the year. There is another slightly strange custom and that is if you hear a cuckoo on the 14th of April you should immediately turn over any coins that you have in your pocket. If you are stood on hard ground you will have bad luck but conversely if the ground is soft then good fortune will follow. April the 14th is considered one of the ‘evil’ days of the year and interestingly enough it was also the day the Titanic sunk. If you wish to know how many years of life you have left then the old thinking was that on hearing the cuckoo you had to count how many times it called, each call equated to one year of life. For other superstitions see the Cuckoo Rock page. There was a tradition whereby one could protect the home from fleas, vermin, and other such unwelcome guests. This was done by taking a handful of earth from the place where ones right foot was stood when the first cuckoo of the year was heard, this soil was then scattered on the threshold of the front door. The nymphs of the Frog Hopper insect surround themselves in a white foam that can be seen on stems of grass, this on Dartmoor (as elsewhere) is known as cuckoo spit. As far as place-names go there are several that use the ‘cuckoo’ element, there is Cuckoo Ball, Cuckoo Field, The Cuckoo Stone, and two Cuckoo Rocks, one of which is another name for Tristis Rock. On Dartmoor the first cuckoo normally arrives between the 17th and 24th of April, this year (2006) must be an early year because I heard one on the 14th of April, and yes I did turn my change whilst stood on some boggy ground. The earliest recorded arrival was in 1994 when one was noted near Black tor on the West Okement river on the 1st of April. The cuckoos tend to favour areas with grassland, fragmented heath and valley mires, popular spots tend to be the combes around Burrator, the Headland Warren area, the valley bottoms near Haytor and in the Houndtor vicinity. The most famous characteristic of the cuckoo is that it lays its eggs in other birds nests and then leaves the adopted parents to bring up the juveniles or in other words it’s a brood parasite. On the moor the adopted parents tend to be Meadow Pipits, Skylarks, Wrens, and Yellowhammers. The adults tend to leave the moor for sunnier climbs during late June and early July, leaving the juveniles to stay on until August. 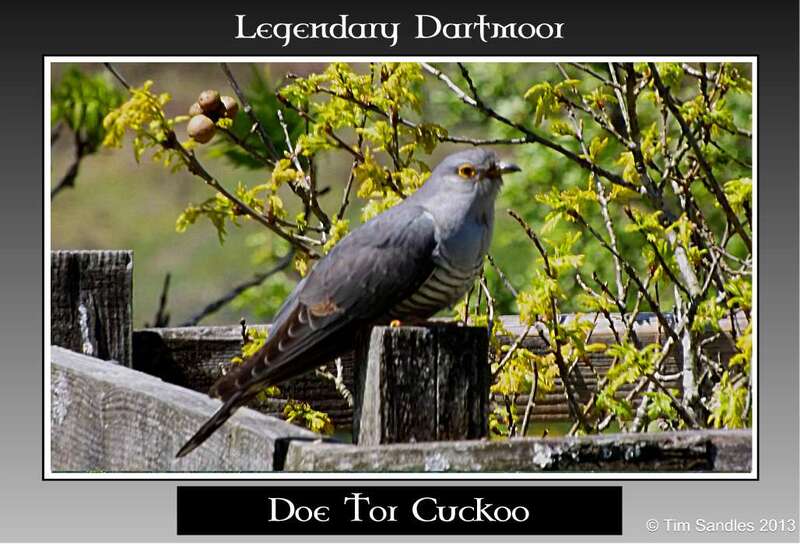 There has been a record of a cuckoo at Ripon tor on the 1st of October 1997 which is the latest ever noted. The bird usually is about 30 – 33cm long and is an unmistakable mottled grey colour with harsh visible bars and a long tail. Their diet consists of insects, especially caterpillars which are abundant in the moorland heathers. In a season they can lay up to 25 eggs and the chicks will fledge between 19 -23 days, much to the host parents relief. At this point I would dearly love to show a photo of a moorland cuckoo but as mentioned above I simply have never been close enough to get one …. On the 4th of June 2013 I visited Doe Tor Farm where there was a singing duel going on between two cuckoos. 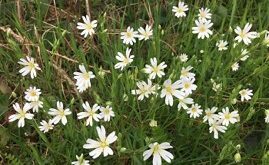 It reminded me of that Led Zeppelin song – ‘A Whole Lotta Love’ where the stereo effects seem to be on a circular loop – cuckoo left – cuckoo right then back to cuckoo left. Eventually one of the two birds admitted defeat and flew off leaving the winner perched in a holly tree which was about 50 metres from where I stood. Then it flew into an adjacent field enclosure and resumed its calling interrupted occasionally for the need to swoop to the ground to pick up some insect. Amazingly the cuckoo was too intent on this process to pay much notice to me so metre by metre I slowly crept towards it. Not wishing to push my luck I stopped at about a fifteen metre distance and managed to get this photo – The Doe Tor Cuckoo. There was also an announcement on the 7th of June that the Dartmoor National Park Authority in conjunction with the British Trust for Ornithology have embarked in a cuckoo monitoring project. This involved fitting four male adult birds with satellite receivers in order to track their movements between Dartmoor, Europe and Africa. The purpose of this initiative is to hopefully learn more about this secretive bird which in turn may help to stop the species’ rapid decline in numbers. At present the cuckoo is designated as a ‘red’ bird which means its at serious risk of extinction.